Mainly, University of Azad Jammu and Kashmir conducts the BSc exams in the month of April while announces the date sheet for these exams in March. The university declares the results after the interval of three months. Similar to the previous years, this year university conducts the exams of BSC in April. University conducts the exams of both the private and regular candidates. Now candidates who were appeared in the annual exams of BSc are waiting for their BSc result 2019. 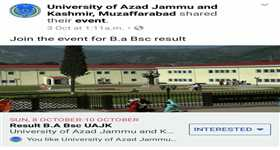 Yet the authorities of university have not announced any confirm date for the declaration of results but it has been expecting that it would be announced in the ending dates of August. We will display the confirm date of declaration of AJK university BSc result 2019 as soon as it would be announced by university. All the hopefuls are advised to stay in touch with us for more details regarding results. AJK University (University of Azad Jammu and Kashmir) is a public sector university which is located in Muzaffarabad. AJK University is one of the oldest universities in Pakistan. It started its working as an authoritative body in year 1980. According to Higher Education Commission (HEC) the university is enjoying the position upgraded universities of Pakistan. University of Azad Jammu and Kashmir clasps an exclusive position in the education system of the country and also a extricate status for accompanying multi-disciplinary research in the field of science and technology, medical research, and social science as well. As a reputed research and reaching institution, University of Karachi is devoted to academic guidance and to excellence in both the ways by developing knowledge and by conveying that knowledge to the students. In fact, AJK University meets the obligations to realm knowledge through its academic and research programs for higher level education. University of Azad Jammu and Kashmir is fulfilling all its responsibilities in raising the standard of education in the country. The university is responsible to conduct the exams of regular as well as private candidates of various levels including graduate and postgraduate and PhD. University usually announces the date sheet of all the programs one month before the commencement of exams. The university holds the exams of all these levels as prescribed by the schedule. Kia kal result announce ho ga?? kaya kal resul ho ga ???? ?